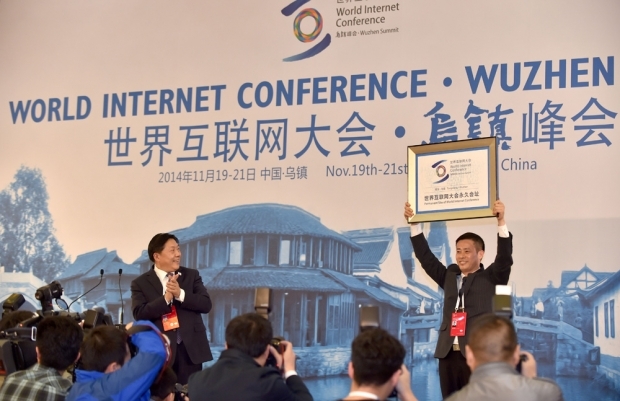 Mayor Zhu Xuelong hoists a plaque naming his city, Wuzhen, ‘Permanent Site of World Internet Conference.’ China’s Internet Czar, Lu Wei, (left), presided over the closing ceremony of the first World Internet Conference on November 21, 2014, in Zhejiang province. Prediction is a treacherous business. I'll slip that noose and focus on one sure thing—namely, that the recent bluster over internet sovereignty we've heard from the Chinese Communist Party reflects the deepest of convictions, anchored by the profoundest of fears: If China cannot reshape the internet, the internet will reshape China. The CCP has always drawn a close link between the control of information and the maintenance of social and political stability (preservation, in other words, of its own rule). The “politicians must run the newspapers,” said Mao (zhèngzhì jiā bàn bào / 政治家办报 ). Loss of the narrative ahead of the brutal crackdown of June 4th, 1989, defined a whole new generation of press controls under the notion of "public opinion guidance" (yúlùn dǎoxiàng / 舆论导向). The possibility of a truly global internet—and especially of dispersed, real-time multimedia content shared across social media with global scale—is a terrifying picture for the ruling Party. China's leaders pine for those good old days (not so long ago!) when these were all domestic matters. When it was enough to crush the green shoots of independence among its newspaper journalists; when they could build a Great Firewall around the problem; when the world was neatly divided into the realms of the internal, or duìnèi (对内), and the external, or duìwài (对外). While the former was the prerogative of the Party’s powerful Central Propaganda Department, the latter was the prerogative of the State Council Information Office (SCIO). Internet controls were always centered in the SCIO because the internet was viewed as fundamentally an “external” medium. This historic shift in priorities in the Party’s bid for information control provides the back story for the rise of Lu Wei, China's new "internet czar”—with his penchant for darkly cute phrases: no one would design a car without brakes/the internet needs brakes. Lu Wei is the head of the State Internet Information Office (SIIO), set up in 2011 and staffed by State Council Information Office folks. Lu is also the director of the new internet security body President Xi Jinping created seven months ago. So Lu Wei is not just China’s internet czar; he is a symbol more broadly of the translocation of the power center of information controls in China. The Central Propaganda Department, with its duìnèi priorities, is no longer paramount. Lu Wei and the Information Office are in ascendance. And this institutional power shift tells us even more clearly than Lu Wei’s characteristic “directness” that China’s strategic information control priorities are now external. David may not wish to make a prediction, but his eloquent description of the changes in Internet policy exemplified by Lu Wei's rise has answered the question: China has already reshaped the Internet. Speaking of “the profoundest of fears,” this fear started several years ago, when the Internet first entered China. On October 20, 2010, Mr. Peng Bo, chief of the ninth bureau of the State Council Information Office (SCIO) gave an internal talk at the Fifth Training Section of Internet News Work. Peng spoke to propaganda officials at the training session: “Over the past ten years, the State’s policy on the Internet has been to make it serve our own purpose: development (of the Internet) first, then follow up with the management (of the Internet). This year, Internet policy has made a significant shift, we will manage (the Internet) according to law, to ensure security."